Kurt Michaelson: RADICAL Small Group Starts Tomorrow! RADICAL Small Group Starts Tomorrow! Tomorrow, at First Assembly of God in Brookfield, we begin launching 12 new small groups of studies with approximately 162 people meeting in one or more small groups. Those groups will meet either at the church, or in one of our group leaders' homes. Our complete list of small groups can be viewed on the church's website that is also a downloadable PDF. 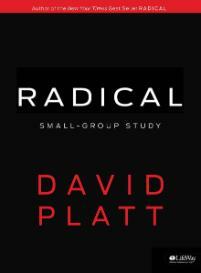 I've chosen to lead a small group based on Pastor David Platt's book, RADICAL. In the book, he challenges the reader to take a close look at their own lives and consider what it means to forsake everything for the Gospel. I'm especially proud of my wife because she was supposed to have a small group study of only 4 women, but I encouraged her to consider leading a small group at the church this fall. Well, 4 women turned into 22 and this is the first time she'll ever lead a small group of that size. The women will be participating in Beth Moore's study, Breaking Free. Here is a promotional video regarding their study. I have already been greatly challenged by the first session of the RADICAL DVD, as well as from reading the first chapter of the book. I can only imagine how the rest of the book and the discussions that will be fostered from the DVD sessions will impact, not only myself, but those that have signed up for this study. For each of our other groups too, I am hopeful that everyone will come away with a deeper, more enriching experience of knowing God and Jesus Christ His Son and the fulfillment of His will for their lives. We're all going to be challenged greatly through David Platt's teaching about RADICAL Christianity because I don't believe that there is anyone, anyone who is a genuine Christian, wants to live complacently and not live with a greater purpose with which they can serve God, for the rest of their lives. If you seriously think about it, when it comes to the Gospel, what part of it is optional for us to live by? The video below is a promotional segment of the study. The curriculum can be purchased from LifeWay and the book, RADICAL is available as an eBook, hardcover or paperback. Check with your favorite bookseller to make your purchase.